The time is turn-of-the-century New York City. Society’s elite host glittering balls inside sprawling mansions while outside, the teeming street harbor secrets of their own. 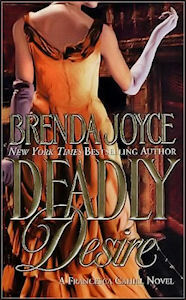 Listen to a audio clip from Deadly Desire, now available on Audible, an Amazon company. FRIDAY, FEBRUARY 14, 1902 — 10:00 A.M.
Francesca Cahill began to plot how to steal out of the house the moment she awoke. She was in the habit of arising at an unfashionable hour, or so her mother accused, but then, Julia Van Wyck Cahill was as fashionable as one of the city’s reigning social matriarchs could be. Francesca never deceived herself–not only was she a bluestocking and a radical reformer through and through; she felt rather certain that, behind her back, she was also sometimes labeled an eccentric. No mind. She did not give a whit for fashion anyway, or parties or shopping or teas. She had secretly enrolled at Barnard College, hoping to attain her degree and follow in the footsteps of her idol, the journalist and reformer Jacob Riis. But in the past month, since January 18 to be exact, her plans had somehow, fatefully, changed. It had all begun with the abduction of her neighbor’s six-year-old-boy. Francesca Cahill had discovered the odd, not-quite-a-ransom note and, more important, had been crucial to the city’s police department in investigating and then solving the case. In fact, she had worked very closely with the city’s new police commissioner, Rick Bragg. She smiled as she paused in the huge front hall of the house that had been built eight years ago and dubbed “the Marble Palace” by the press. She directed her smile at the new doorman, who she thought was named Jonathon. He was her own age, and, as blond and blue-eyed as she, he smiled back. We are in dire need of your help! Do come immediately. The note had been written by Mrs. Channing, her brother’s fiancée’s mother. And apparently it had been written in extreme haste, as the handwriting was so poor it might have been executed by a child in grade school, not to mention the fact that the envelope had not carried Abigail Channing’s name or address. Francesca had not a doubt that the Channings were in trouble. She smiled bravely at the doorman. “Jonathon, if you do see my mother, is there any chance you might not mention that you have seen me go out?” As she spoke, she glanced guiltily down the hall, where huge Corinthian pillars were set at intervals until a wide white alabaster staircase led to the three floors above. She had badly burned her right hand while saving the life of Maggie Kennedy–a poor seamstress with whom she was starting to have something of a friendship. Now it was thoroughly bandaged, and she had been ordered to remain in her bed–or close to it–for an entire week. As much as she had no wish to gain an infection, the doctor had told her two hours ago that she was healing quite nicely. In fact, her hand no longer hurt her at all. And how could she refuse a call for help from the woman who would one day be her brother’s mother-in-law and, by familial extension, a second mother to her? Francesca was very glad now that she had refused to take laudanum that morning, which she had instead discreetly thrown away. Francesca suspected that her mother was hoping to do far more than merely obey Dr. Finney’s instructions to keep her at home for an entire week. She thought, butcould not prove, that Julia wished to dull her own daughter’s personality with the laudanum, in the hope of keeping her out of further jeopardy and any more criminal investigations. Her entire family had been thoroughly undone by this latest incident; in fact, almost everyone she knew was quite upset that she had been so badly hurt while attempting to protect Mrs. Kennedy. Jonathon looked very unhappy indeed. Taking a big breath, Francesca stepped outside into the frigidly cold air, the huge front door closing behind her. Her right hand was bandaged and so she wore only one glove on her left. She began to smile, a bit exultant. It was a rare day indeed that one outwitted Julia Van Wyck Cahill. Of course, she must not gloat. There was serious business ahead, if her instincts served her. The sweeping front lawns were crusted with hard, white snow. Francesca paused below the front steps, sighing with relief. Her gaze swept past the circular drive, the wroughtiron gates, and the light vehicular traffic on Fifth Avenue. A four-in-hand was coming down the street, as were two hansoms and a very elegant brougham. Even from this distance, she could see past the trees bordering Central Park, and several horseback riders were on the riding path, while a woman and two children strolled beside it. It was actually, in spite of the cold, a beautiful day. And then a man she had quickly come to despise–and fear–spoke into her ear. Francesca nearly jumped out of her skin as she whirled to find Arthur Kurland, the dastardly reporter from The Sun, standing behind her. He had been hiding behind two man-sized Greek urns just below the mansion’s front steps. “Then you are wasting your time, as I have had a touch of the flu and I have nothing interesting to report to you.” She started walking briskly down the drive toward the avenue. Her intention was to hail a cab, as her father, Andrew Cahill, had his coach and Julia would be out to lunch shortly in the other Cahill vehicle. Francesca halted in midstride, facing him with a dreadful feeling. Was he insinuating something? He had seen her and Bragg together too many times to count–they had investigated three politically sensitive cases together, starting with the Burton Abduction. “Miss Cahill?” Arthur Kurland gripped her arm. “It is so interesting–but hardly newsworthy–that Commissioner Bragg has been calling on you every day since the Cross Murderer was incarcerated. Or is it newsworthy?” He grinned. Francesca started. Bragg hadn’t said a word about his father returning to the city. “Really?” Francesca was cool, hardly feigning surprise. “I broke it,” she snapped, but her anger was only a mask for her fear. She froze in midstep and faced him. Real fear seized her. This man was a prize-winning journalist. And he had no compunctions, no morals. It was only a matter of time before he pieced together the puzzle of all of their lives. And then what? “Tell me something important, something that I do not know.” His eyes were suddenly hard. “I have nothing to tell,” she said tersely. “Really? Then why is guilt written all over your face?” Kurland asked. He whipped out a small notepad and a lead pencil. “Yes?” he asked eagerly. “How clever of you,” she said, feeling ill. She would make the news yet again, and her family would not be happy about it. “You see, a street urchin was handing these out yesterday not far from Union Square.” He reached into his pocket and handed her a calling card. Of course she recognized it. After all, it was hers. The Channings daringly lived on the West Side, which residents like Francesca felt was akin to Texas or the moon, as it was so distant and remote from the rest of the city. Francesca had been shaken from her encounter with Kurland but resolutely dismissed it from her mind. Sarah Channing had become a good friend since her engagement to Francesca’s brother, Evan. Although they were nothing at all alike in appearance or manner, Sarah and Francesca were actually quite alike. Sarah was a passionate artist and, in fact, a bohemian at heart. Like Francesca, she had no use for society, its rules, displays, and etiquette. In fact, quite shockingly, Francesca had heard Sarah say she wished to never marry. Francesca had recently decided that she would never marry, either, never mind her mother’s plans. If Sarah’s mother was in trouble, Francesca was determined to help. And it never crossed her mind that she might not be able to do so. Francesca paid her cab fare and approached the mansion, which was quite new and horrendously Gothic, not to mention huge. The horse trotted away as a trolley approached, its bells clanging. Francesca paused on the top step before a pair of wooden doors that would have been beautiful had they not had gargoyle heads in each center. When Sarah’s father had died, her mother, a rather frivolous and harmless socialite, had inherited his millions and promptly built their new house. Mrs. Channing was not known for her elegance or good taste. Francesca’s knock was promptly answered, and she was told by the doorman that neither Miss nor Mrs. Channing was receiving visitors. “Would you care to leave your card?” the liveried doorman asked. His uniform was red and gold. “I am afraid that she is in her rooms and has said that she will not come down,” the doorman said gravely. The butler sailed to a stop before her. “Mrs. Channing will see Miss Cahill, Goodard.” He gave the doorman a significant look. “Due to the Crisis,” he said. “There is a crisis?” Francesca asked quickly. “I shall inform Mrs. Channing that you are here,” the heavyset butler intoned gravely. Francesca stepped forward at the sound of Mrs. Channing’s voice. A not-quite pretty woman with reddish blondhair who was extremely well-dressed, yet overdressed, and who somehow reminded one of a flighty and mindless bird was entering the foyer, her slippers clicking on the marble floors. “Francesca! Thank God!” She clapped her hands together, but tears filled her wide eyes. One of her rings was a diamond the size of an acorn. “What has happened?” Francesca repeated, thinking there must have been a crime. A familiar tingle was now running up and down her spine. “Come with me!” Mrs. Channing exclaimed hoarsely. “This is something that words cannot do justice to, that words cannot describe.” And she slipped free of Francesca’s arm and began hurrying into the hall. Francesca started and followed, not bothering to hand off her coat, hat, and single glove. What could have possibly happened? Had a bedchamber sneak been at his work? This was the most common kind of crime in the homes of the rich. She quickly realized, as they moved down one hall and then another, that they were not heading in the direction of a bedroom, as all bedrooms would be on the second floor. They were moving toward Sarah’s studio. She was perplexed. If not a burglar, then what else had transpired? Suddenly Mrs. Channing turned and placed her back against the door of Sarah’s studio, as if to bar the way. “Prepare yourself,” she warned rather theatrically. But her eyes were huge with dismay. “Sarah has taken to her rooms, and she will not come out,” Mrs. Channing said. Mrs. Channing gave her an abrupt nod as if to say, “Oh yes, this is grave indeed,” and she thrust open the door. Francesca stepped inside. The room was all windows, a true artist’s studio, so it was brilliantly lit. She cried out. Someone had been on a rampage in the large, airy room. At a glance, it appeared to have been ransacked. Canvases, palettes, paints, and jars were overturned. Two windows were broken, as if someone had smashed them with an ax or thrown an object through them. Glass covered the floor by them. Paint in the primary hues had been splattered across the floor and walls, the effect vivid, brilliant, disturbing. Because amid the yellows, blues, and greens there was dark, dark red and slashes of black. It was almost as if another artist had formed an abstract collage of colors upon the floor. And for one instant, Francesca thought the red was blood. She rushed forward, kneeling, dabbing her finger into one drying pool of dark red. It was paint, not blood. Relief flooded her instantly. Then she saw the canvas lying faceup on the floor. Whatever that canvas had once been, it was now unrecognizable. It had been saturated with the same dark red paint that looked exactly like blood, and then it had been slashed into ribbons.